The studies carried out in 2014-2015 by the Professor Yury Bandazhevsky and Associate Professor Nataliya Dubovaya with the help of public health institutions and international organisations showed that a significant number of children from families in Ivankov and Polesie districts chronically living in the territory contaminated by radioactive substances due to the Chernobyl nuclear power plant accident have considerable health problems. Given the nature of changes in the child’s body, one should anticipate that in the future, as a child grows, these problems may provoke severe diseases ending in death or disability [a collection of scientific articles «Ecology and Health», № 1, 2, 3]. A high mortality rate associated to a greater extent with cancer and cardiovascular diseases is recorded in areas affected by the Chernobyl nuclear power plant accident . It is extremely important practically and scientifically to find causes of this phenomenon. In this regard, it is reasonable to carry out studies to assess blood concentrations of homocysteine - an amino acid formed during transmethylation of methionine - a sulfur-containing amino acid essential for the human body. During metabolic reactions, homocysteine is converted into cysteine or transformed back into methionine. The resynthesis of methionine from homocysteine is carried out during the metabolism of folic acid by transfer of the methyl group involving methylenetetrahydrofolate reductase, В12-dependent methionine synthase and methionine synthase reductase. Elevated levels of homocysteine in the body may be caused by folate metabolism disturbances, including genetic defects of above enzymes and may lead to serious consequences in the form of a higher risk of developing cardiovascular diseases, cancer, diabetes, chronic miscarriage, congenital abnormalities and other diseases . The purpose of this study was to assess blood homocysteine concentrations and genetic system of enzymes associated with folate metabolism in children from families continuously residing in an area affected by the Chernobyl nuclear power plant accident. In the first decades after the Chernobyl nuclear power plant accident, vast territories of Belarus, Ukraine and the Russian Federation were heavily contaminated with radioactive substances, primarily 137Cs and 90Sr [1, 2, 3]. Radionuclides were transferred from soil to the body of people living in these areas through food chains and were intensively incorporated by vital organs and systems, including the heart, leading to serious interference with metabolic and electrophysiological processes in cell structures [2, 4, 5]. 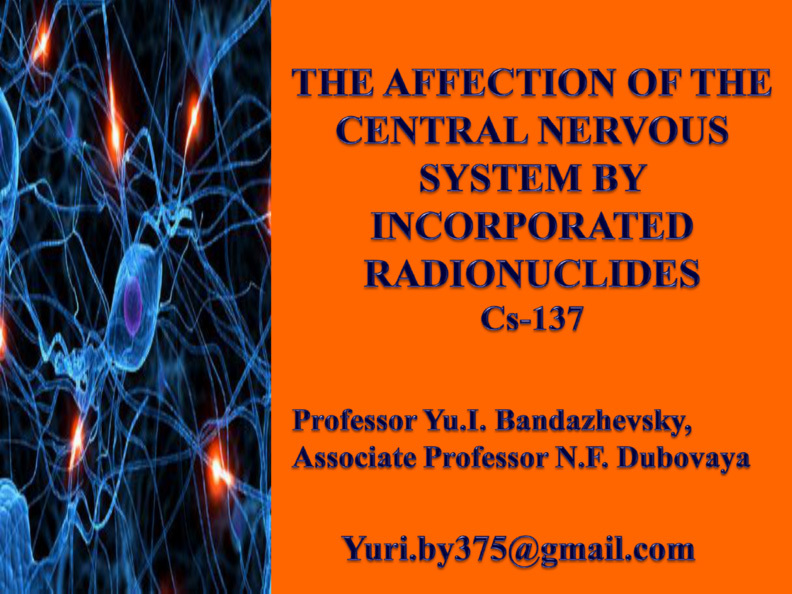 A correlation between 137Cs radionuclide concentrations in the body and the occurrence of a disturbance in conduction of the electrical impulse in the heart muscle of children was found [2, 4]. In this regard, it is appropriate to examine on a regular basis the cardiovascular system in the entire child population residing in an area affected by the Chernobyl nuclear power plant accident. The aim of the paper was to evaluate the cardiovascular system in children from Polesie and Ivankov districts of Kyiv region, Ukraine affected by the Chernobyl nuclear power plant accident. Multi-media slides of the speech by Professor Yu.I. Bandazhevsky, given at the conference «Chernobyl: the Prospects of the Second Generation» (April 22, 2015, Paris, Second District Council Office), held with the participation of the Member of the European Parliament Michèle Rivasi and former Minister of Environment of France and former Member of the European Parliament, a lawyer Corinne Lepage. Bandazhevski Yu. I., Dubovaya N. F.
Human health protection under conditions of radiation contamination of environment. - Ivankov: «Ecology and Health» Coordination and Analytical Centre, Private Enterprise, 2014, - Dnepropetrovsk: Cerednyak T. K., 2014. - 70 p.
The book is dedicated to the protection of human health under conditions of radiation contamination of environment. There were described pathological conditions induced by Cs-137, the most common radionuclide in the environment, incorporated into the body. The main directions of health protection of people continuously living on the territory affected by the nuclear power plant accident were presented. 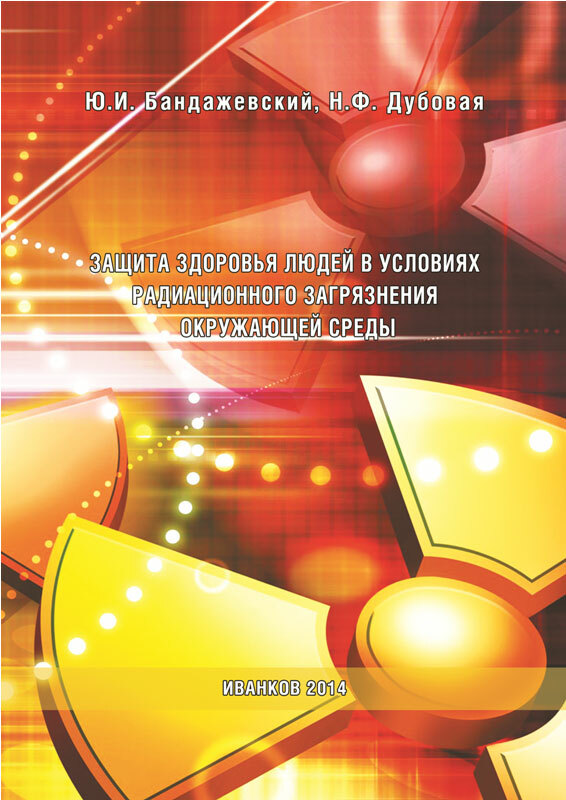 The book is intended for healthcare practitioners, experts in the field of radiation protection and the population living in the area affected by the nuclear power plant accident. Since 2013, the European Commission has launched in Ukraine a large-scale humanitarian project aimed at social support of the population in Ivankov district closest to the Chernobyl nuclear power plant. Under this project, the complex research will be carried out dedicated to the assessment of the impact of environmental factors on human health. In this regard, we are recruiting staff members and postgraduate students to work in a research group in a physico-chemical, biological and radiological analysis laboratory. Applications will be considered from candidates with a university degree in a physico-chemical, biological (including Plant Physiology and Agricultural Chemistry) and medical field, with experience of working in analytical laboratories and laboratories of Experimental Biology and Medicine. Несмотря на то, что от крупнейшей техногенной катастрофы нас отделяют почти три десятилетия, о ее последствиях для здоровья, в частности населения, проживающего на загрязненных территориях, известно немного. Отсутствие объективной информации, ее умалчивание (либо дозирование) привели к игнорированию опасности, мол, радиация уже ушла, а если что-то и осталось, бояться нечего — как жили, так и будем жить на своей земле. "Пережили Советы, переживем и радиацию" — шутят старики-полещуки. Однако данные медицинской статистики отнюдь не оптимистичны. Так, например, смертность в Иванковском районе Киевской области вдвое превышает рождаемость. Показатель распространенности рака щитовидной железы среди населения района в постчернобыльский период увеличился в 40 раз, в то время как до аварии на ЧАЭС это заболевание не регистрировалось. Медики обеспокоены ростом сердечно-сосудистых, онкологических и других патологий. Высокий уровень заболеваемости наблюдается среди детей, и что характерно — все чаще у них диагностируют "взрослые" болезни. Социально-экономическая ситуация в значительной мере определяет депрессивность района: на загрязненных местностях нет предприятий, люди сидят без работы, потребляют продукцию, которую сами выращивают, едят собранные в лесу ягоды и грибы. Причем никакого контроля над содержанием радионуклидов не существует! Несмотря на то, что этот, граничащий с 30-километровой зоной, район — один из наиболее загрязненных радионуклидами цезия-137 и стронция-90. Introduction. After 25 years since the accident at the Chernobyl nuclear power plant, there is an open question on whether it is possible to receive farm products safe for human health within the affected area. In this respect, it is advisable to conduct experimental studies involving laboratory animals with further extrapolation of received results to humans. Purpose. A study of processes of prenatal and postnatal development in the laboratory animals - Syrian hamsters (Mesocricetus auratus) - under the influence of a radiation-chemical factor as part of a food product - oat grain grown within the area affected by the accident at the Chernobyl nuclear power plant. Methods. Physiological, morphological (embryological), haematological, biochemical, radiometric, physico-chemical, mathematical-statistical. Results. Found that the grain oats, grown in 2011, in the areas affected by the Chernobyl nuclear power plant, has, in comparison with the control, increased amounts of radionuclides Cs-137 and Sr-90, as well as the chemical elements Ba, Sr, Mn (in 2,0 or more time). Identified significant violations of the processes of antenatal and postnatal development of offspring of Syrian hamsters, who ate grains indicated in pregnancy and lactation. Interruption of pregnancy in the pre-implantation stage stated in 43.3 % of all cases of fertilization (in the control group - in 23.8% of cases). In 41.2 % of pregnancies registered fetuses with birth defects, in the form of cleft lip and palate, cerebral hernia, exencephaly (in the control group - 12.5 % of pregnancies (p <0,05)). A statistically significant decrease in the number of red blood cells, decrease in hemoglobin, the rise in the number of eosinophils and high content of urea in the blood serum of calves main group compared to the control, indicating that the occurrence of structural and functional changes in the vital organs of test animals. Summary. 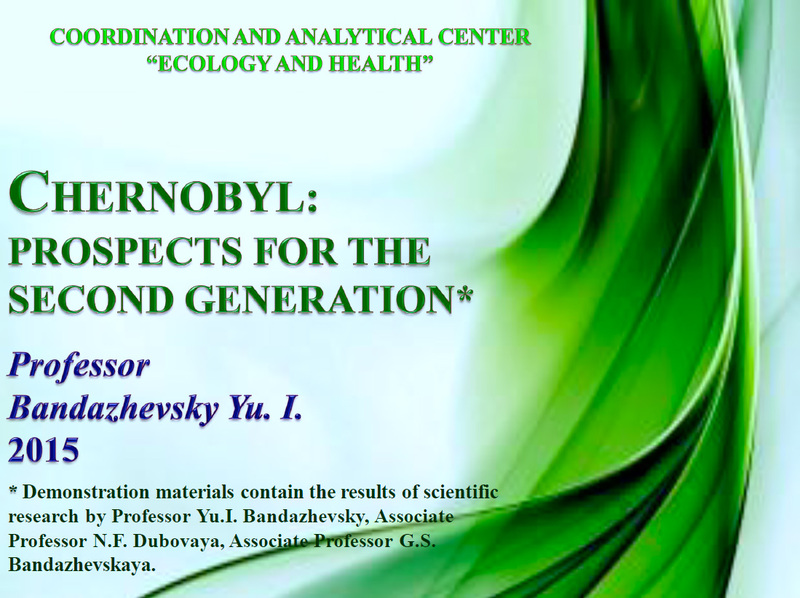 The received results pay attention to the necessity to evaluate the role of the radiation-chemical factor present in soils of areas affected by the accident at the Chernobyl nuclear power plant in the reproductive losses in humans. 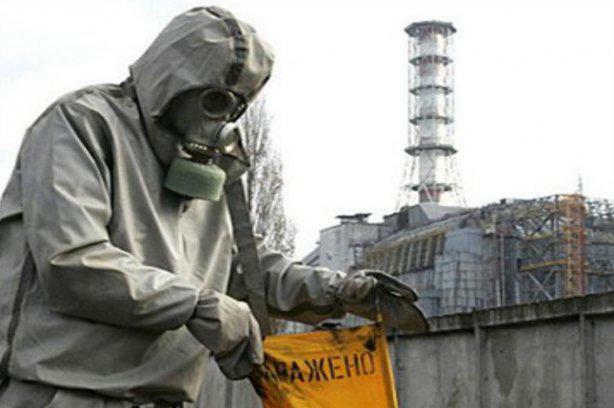 Кey words: radiation-chemical factor, Syrian hamsters, prenatal development, postnatal development, radioactive contaminated areas, accident at the Chernobyl nuclear power plant. Yuri I. Bandazhevsky "Human Health and Incorporated Radionuclides." The population of the Republic of Belarus, Ukraine and the Russian Federation living in areas affected by the accident at the Chernobyl nuclear power plant has been exposed to adverse effects of long-living radionuclides for 28 years, and primarily of 137Cs (radiocesium), given the amount released into the biosphere in 1986 . Immediately following the accident, radiocesium had been on the surface of the soil, and naturally could not have been available to the root system of plants, unless the upper layers of the soil were inverted while ploughing. For the same reason, the mushrooms just after the Chernobyl accident could not have contained Chernobyl cesium in high concentrations. It takes several years for them to accumulate significant quantities of radionuclides. However, the mushrooms that grew in the affected area in 1986, had contained high concentrations of radiocesium. This situation may be explained by the findings of the studies carried out by the Institute of Biophysics of the Ministry of Health in the Russian Soviet Federated Socialistic Republic, which prove that a large part of the Republic of Belarus had been contaminated with radiocesium in the 60s of the last century, for which reason this radionuclide had been detected in meat and dairy products in high concentrations . Radiocesium contamination maps for the Belarussian-Ukrainian territory Polessye before and after the Chernobyl accident are practically identical . So what did the specialists that carried out radiometric measurements in areas affected by the Chernobyl accident in 1986 find? This raises the question relating to the calculation of radiation doses absorbed by the population living in these areas. At the official level, it was decided to calculate doses received by the population from affected territories starting from April 26, 1986 - the date of the Chernobyl accident. The health of the population has been assessed and continue to be assessed also beginning from this date. But what about radiation doses received by the same population over a 20-year period prior to the Chernobyl accident?